Part road movie, part dinosaur actioner, and fully gushing with family values, ICE AGE: DAWN OF THE DINOSAURS is the third and most spectacular in the ICE AGE series – and probably the least interesting. If you’re not as tired of these characters as I am, you’ll enjoy Manny the Mammoth (Ray Romano), Sid the Sloth (John Leguizamo) and Diego the Sabretooth (Denis Leary) espousing their thinly disguised lectures on how syrupy-sweet it is to be a part of their misfit family. In the original ICE AGE, the family angle was very subtle and touching – but the writers of DAWN OF THE DINOSAURS seem to think we need it said very obviously very many times by as many talking animals as possible. We get it: Family Good, Loneliness Bad. When Manny and his mammoth “wife” Ellie (Queen Latifah) are expecting, Sid and Diego are psychologically affected: Sid finds dinosaur eggs buried in the ice and pretends to be a mother to them (pretty disturbing stuff if it weren’t for being a cartoon) and Diego decides to pursue his bachelorhood elsewhere. Blatantly ripping off Jules Verne’s JOURNEY TO THE CENTER OF THE EARTH, Manny and friends, in an effort to rescue Sid, track the mother dino down a hole in the ice to find a subterranean world with an artificial sun where dinosaurs still rule the Earth – or at least, the middle part of it. 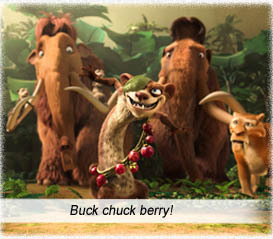 They meet Buck (Simon Pegg), a crazed, one-eyed weasel who knows how to survive in this wilder world, who leads them through its dinosaurian dangers. His raison d’être is lifelong battle with Rudy, a mysterious dinosaur that the film reveals only in its last scenes for maximum impact – a giant, scientifically-incorrect dinosaur that is a cross between a crocodile and a Spinosaurus. The animation and creativity is spectacular, and the film is entertaining, but it just doesn’t grab me. Either I’m getting too old, or these animals are. And neither of us is getting any funnier. And that squirrel Scrat – always an acorn-chaser, never an acorn-eater – is wearing on my nerves. A female Scratte is added to the acorn chase, using her sexual wiles and any other trickery on Scrat to get what she wants – in other words, a typical female. Waitaminute! This is called “Dawn Of The Dinosaurs” as if dinosaurs arrived after mammals. We sincerely hope the kids watching this cartoon have already learned that dinosaurs were extinct millions of years before large mammals like mammoths evolved. Yes, we hope. We won’t go into the disinformation perpetuated by creationists, fundamentalists, ignoramuses and Republicans. No wonder I couldn’t get my teeth into this film. aka: ICE AGE 3: DAWN OF THE DINOSAURS. Directors: Carlos Saldanha, Mike Thurmeier. Writers: Peter Ackerman, Michael Berg, Yoni Brenner, Jason Carter Eaton, Mike Reiss. Starring: Ray Romano, John Leguizamo, Denis Leary, Queen Latifah, Simon Pegg, Josh Peck, Seann William Scott, Jane Lynch.